Alumni, students, parents, staff, and friends of Babson are invited to come cheer on the Boston Red Sox as they take on the visiting Detroit Tigers at Fenway Park. Babson reserved section tickets are available now. A portion of the proceeds from each ticket will be donated to Babson College Athletics on behalf of the Boston Red Sox. 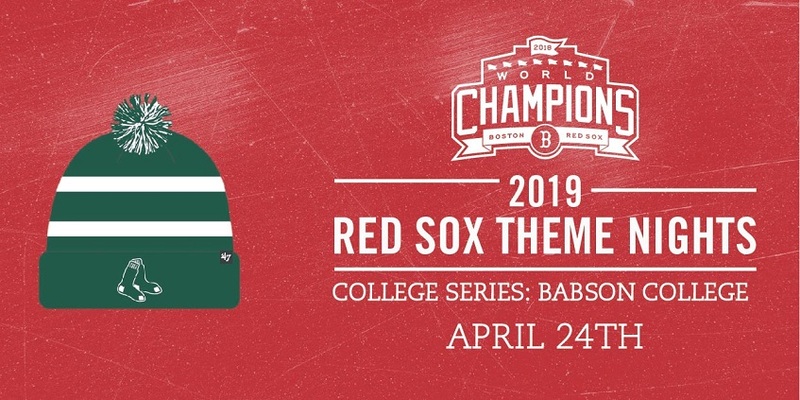 Let us know you're coming by registering below to receive Babson updates on our pre-game reception located on the Sam Adams Roofdeck and where to pickup your complimentary Babson College Red Sox Knit Hat by '47 Brand on the day of the game. Limited tickets available. Register today. Please consider a gift to support the Athletic Excellence Fund. Your gift allows our student-athletes to succeed in competition and in the classroom. Babson College is pleased to pass along information regarding alumni volunteer activities and events that may be of interest to you. The College does not directly oversee, supervise, or control these activities and events, and assumes no responsibility for any related damage, injury, or loss. Images may be captured during events organized by the College and by regional clubs and affinity groups using film photography, digital photography, video or other medium. These images may be used on College websites, in digital photo albums, on social media pages, and in electronic newsletters. By attending this event, you consent for Babson College to publish using your image and likeness in this manner. Upon registering for this event, you will automatically be added to a public ATTENDEES page displayed on the event website. If you would like to be removed from this page, please contact the Events Management Office at eventsmanagement@babson.edu or 781-239-5265. Thank you.